We are the world's premiere developer of antique, esoteric, vintage, outdated and old film. If you have it, we can develop it. 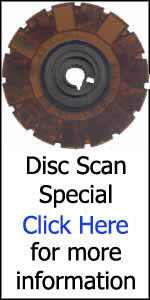 Our specialty is old film developing, including disc film and 126 film. If you have film you would like to have developed please see processing services. Click on these links for information and prices: old film developing, processing services, process list, film scanning, or use the navigation bar at the left. You may also want to try using our Process List or search page to locate your particular type of film. If you are looking to buy film or equipment please follow these links: equipment, film. We are experts in all areas of photo restoration, film scanning, duplication of prints, prints from slides, and VHS or DVD movie transfers. We can also develop damaged or wet film. Please be sure to check our Frequently Asked Questions (FAQ), News and General Information pages before you leave. Welcome to Rocky Mountain Film Laboratory's home page. We have been in business for over 40 years and take great pride in our ability to obtain images from your old films. Our lead technicians have over 100 years of combined experience and we continually advance our knowledge through in-house training. This makes us the best at obtaining your memories. We have developed more than eleven million feet of film (including film for major motion pictures you have probably seen) and have over one-quarter million satisfied customers. Let us know how we may help you. RMFL is family owned and operated. We have been members and featured by the Photo Marketing Association as a unique specialty lab. Click here for the article. Please include card number, expiration date, your billing address and amount to charge your card with your order.